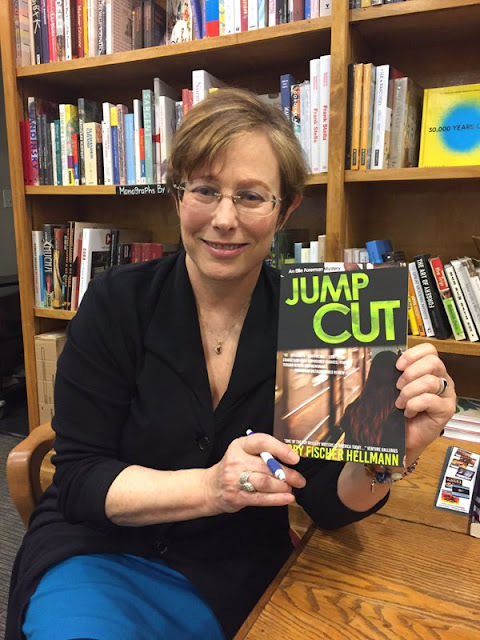 Author Libby Fischer Hellman is stopping by today to answer questions about her new book from Poisoned Pen Press, Jump Cut. 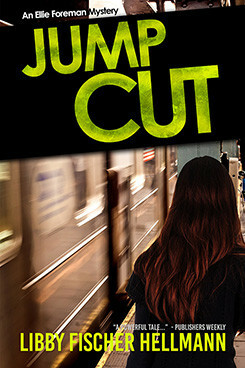 Where did you get the idea for JUMP CUT? How did you know that was the book you wanted to write? I used to say I was “writing my way around the genre.” I’ve written 13 novels, and they include an amateur sleuth series, a PI series, thrillers, hard-boiled, historical thrillers, romantic suspense, even a cozy. I like the challenge of trying new things. But when I first started reading crime fiction, I read espionage thrillers. Particularly what I call the four “L’s: Le Carré, Ludlum, Len Deighton, and Ken FoLLett… (Okay, Follett is a stretch) Btw, most of the authors writing espionage then were men, but that’s another story. Add to that years of watching “24,” “MI5,” and “Homeland,” and it’s not surprising that I eventually wanted to write espionage thrillers. At the heart of an espionage thriller are two issues: trust and power. Who can a spy trust and how does an agent make that decision? How do you know your asset isn’t a double or even triple agent? What do you do when you realize you can’t trust anyone? As for power, usually it’s the power of information. What decisions come from a spymaster who has more information than their target? Actually, I believe spies start out with the best intentions, to protect their homeland or stop an enemy. But it’s easy for a spy to become untethered. And when you layer on the effect of technology, espionage is now possible on a mass level. The challenge was creating a story that manages to explore these issues but doesn’t beat readers over the head with them. I visited The Spy Museum in DC. And Bletchley Park in the UK. I read voraciously, both fiction and nonfiction. Then, as is my pattern, I tested the waters with a short novella. The Incidental Spy came out last fall and focused on espionage during the early years of the Manhattan Project in Chicago. It turned out pretty well, so I took a deep breath and moved on to modern espionage, taking into account everything I discussed above. Jump Cut is the result. I sent my protagonist on a 10-year hiatus while I wrote other thrillers. That seemed to do the trick. I also try to keep Ellie’s sense of humor fresh and “au courant” with references to what’s going on in the world. Her daughter, Rachel, has become an adult, so that has opened up a host of new possibilities. In fact, Rachel may become a fraud investigator in the not too distant future, which could mean she’ll continue the series when Ellie eventually retires. I was a history major in college and love doing research, which I do for every book, whether it’s making sure the clothing worn by characters is appropriate for the time and place… or trying to understand how drones work. Jump Cut was a bit of an exception in that so much of the content was in the news on a daily basis. Whether you think Edward Snowden is a hero or a traitor, he did make us aware of just how pervasive the government’s electronic reach is and how deeply it encroaches on our privacy. That said, I did have to talk to intelligence agents, including those in the military, and no one, civilian or military, wanted their names made public. I also contacted the FBI to fact check and dug up as much information as I could about the Uhghurs. Btw, I have a radio show/podcast called Second Sunday Crime, and there’s an interview with the Bureau’s head of corporate espionage right here. Libby Fischer Hellmann's latest novel is Jump Cut. She left a career in broadcast news in Washington, DC and moved to Chicago 35 years ago, where she, naturally, began to write gritty crime fiction. Thirteen novels and twenty short stories later, she claims they’ll take her out of the Windy City feet first. 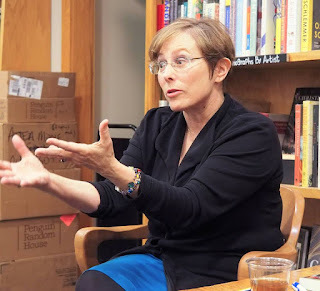 She has been nominated for many awards in the mystery writing community and has even won a few. More at http://libbyhellmann.com. Fascinating. I love to hear how authors do research and this book sounds great. Into the pile you go! I'm a big thriller fan and this sounds right up my alley. This sounds exciting. A women writing espionage thrillers, terrific!! How interesting to hear from an author and I'm a sucker for spy novels! Awesome post. Now I've got to read this one. Sounds like a good read. New to me author, adding to my TBR list. great interview! i love reading about others creative processes! Our winner is Sharon. Look for an e-mail shortly. Excited and can't wait to read this one!